Many times I’ve been with friends and family in Paris and we’ll go into a food shop. Now I’m not picking on anyone in particular, so if you think I’m talking about you, I’m not. Think of this as a composite of lots and lots of people. And I’m sure I’m guilty too, so I’ll toss myself in that mix. I’ll show people something, say…the display of jams made by Alsatian Christine Ferber. She makes lots of different flavors from all sorts of fruits and they’re supposed to be wonderful; the best in the world some say. I make my own jam, and I make a lot of it. I go to the market near the end of the day and buy a case of whatever is in season, and very ripe, and will spend the rest of the day making jam. Two of the four shelves in my refrigerator are stocked with jam. I have a lot of jam. Mine’s pretty good (if I do say so myself…) and although the Ferber jams are supposed to be very good as well, I don’t feel the need to spend 6.5€ on a jar of it. Sorry. I’m not being cheap, but it’s like paying for someone to brush my teeth for me. I’m pretty capable of doing the task myself—although twice a year I do let my dentist do it. And he is, like…schwing!…so I don’t mind. And I also mention a lovely woman I met who bought a jar, got back to the states, and loved it so much she asked someone to ship her some. (They’re not available in the US, and I don’t ship…so don’t even think about asking…) I say it to provide additional incentive to try it, if they want. One fine morning I told someone that I hadn’t tasted them, so they bought me a nice jar as a gift. If I may be so bold (again) and digress, I will often go to a restaurant or try something just because I know someone is going to ask me if I’ve been there or tasted it. It’s a pre-emptive strike. I went to a three-star restaurant that turned out to be lousy; the fixed-price menu cost 405€ ($583) per person, without wine. Now I can hold my head up proudly, albeit with a lighter wallet, and say I didn’t like it—I paid the price for that privilege. Finally I opened that jar of jam, made from griottes or sour cherries, and it was indeed good. Very good, in fact. And I’m delighted to report my findings on that particular flavor of jam. I don’t know what to do when people ask. I want to be nice and helpful and above all, charming, but I can’t tell them. I just stand there, grasping for words to say, waiting for something profound to drop out of my mouth. Is there a way out of this jam? Or you could just give them lousy advice. Just name one. Sticky people just … stick. I, too, love sour cherry jam and it’s hard to get sour cherries here. I get about half a kilo from the one wild tree I found, some years, and I make a sour cherry liqueur with them. Raspberries are also hard to find and hard to pay for, so I do buy raspberry jam for certain desserts I make, but otherwise, when you are charmingly sweating over the jam pot, so am I. Mine is copper, what’s yours like? Start selling your own jam — then you can harass people about tasting yours and you’ll make a buck. Why would you buy a competitors jam … Perhaps you’ll earn 405€ so you can get out and try something else that you don’t care that much about. Recommend that they get a jam made with a fruit they can’t get at home. 405 euros, ouch. Would you mind revealing (e.g. by email) which 3 star? 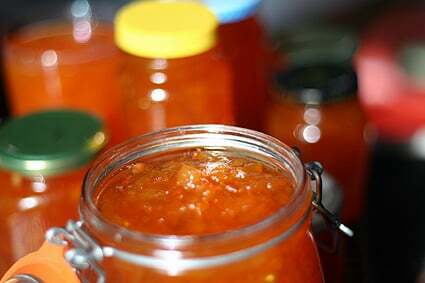 Now, can you share with us some hints for jam-making wannabes? I imagine that with your breadth of Paris food knowledge it isn’t only jam we are talking here. As far as fielding “Which one is the best?” questions I would let them know you are performing an informal survey and it would be great if they tested a few flavors for you. I know you used to make a lot of jams, jellies, preserves, etc. when you were in San Francisco and brought them to our elderly relatives as gifts–Seville Orange marmalade, etc. I know you have some recipes for these in your books, but any favorites you might want to share again, hint hint??? Do the French eat pickles and what do you have to say about that? When I used to work at an unnamed large chain bookstore, people used to ask me such inane questions, too, like : which of these antiques catalogues is the best? Having no interest in antiques (or the time to read every single book in a 4-story BIG bookstore), I would gently suggest that they sit down (in a comfy chair!) and look through them to see which one they liked better. Usually, that only got me complaints to my supervisor that the customer had never received such rude service (! ), so I learned my lesson and just made something up. Curiously, being dishonest worked best. Go figure! I love your blog and look forward to every post! 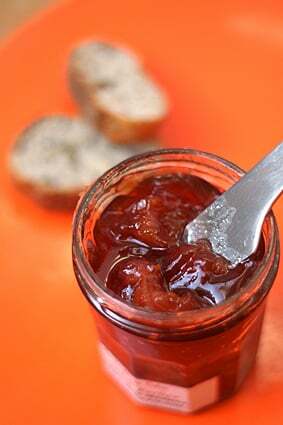 I am a jam making junkie and Christine Ferber’s book, Mes Confitures, is my favorite. In the interest of research, I actually sprang (while grimacing) for two jars. 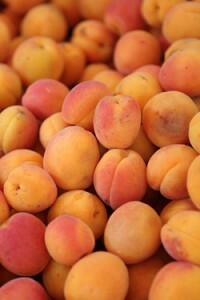 I preferred Peches des Vignes to Quetches, but peaches have always been my favorite and the plum was still very good. I picked sour cherries from a friend’s tree this year to make jam, but unfortunately, she has moved. I actually bought bags of frozen griottes at Picard in Paris and dragged them back the Netherlands with me so I could make gifts. Frozen are not cheap but since the cost of the fruit works only one euro per jar, I think I’m ahead. Btw, we loved the sea salt/butter caramel and your book! We bought a jar of the strawberry jam when we went on the chocolate tour with you, because I had read so much about her jams. It was good, but nothing I’d buy again for that kind of money. I bought Ferber’s jam making book for a friend several years ago. Apparently she adds no pectin or other thickener; she just cooks the fruit down and down and down. I may try this the next time 20# of strawberries land in my lap. What a curious question. How are you supposed to know what other people will like best? Too bad they don’t have jam sampler packs or even better, open bottles of each one for people to taste. I was in a honey store, La Maison Du Miel, a few months ago and you could taste each flavor before making a decision. How would you know otherwise…and at those prices, it could be an expensive mistake. I have the Christine Ferber book Mes Confitures but I’ve never made anything because I’m afraid of poisoning people (I say as I shrink away in embarrassment). I admire the confidence of those who are comfortable with the whole canning, preserving process. David, do you always keep the jams you make in the refrigerator? I think you are better off trying the ones that are harder to find the fruits of. Like I’ve not seen many sour cherries around these parts and my grandma used to have the most wonderful cherry tree, so I’d probably start as you did. My suggestion: acknowledge your ignorance, but then offer your expertise. E.g, “I haven’t tried most of these, and I don’t know what kinds of flavors you enjoy most, but if I were going to buy some I would try the [variety] because [reason].” I suspect many of the people asking just want an easy way to make a hard choice. I think the “unusual fruit” approach is a good one (it’s how I would make the purchase!) –but what if the unfamiliar fruit is an acquired taste (paw-paws come to mind…)? Your knowledge could be helpful in that regard. you could just tell them the TRUTH, which is, you dont know, because YOU DONT NEED to know! because you dont buy jam! you make you own! One of my favorite Ferber jams is the banana-passion fruit — the crunch of the passion fruit seeds is a bonus. It’s perfect on yogurt. But I overwhelmingly prefer my homemade jams (using Ferber’s recipes), to hers. Brighter flavor, less cloying. Perhaps it’s the fruit (Blenheim apricots, French sugar plums) that I seek out or the reduction in sugar. I think this post is your way out! I’ve been wanting to make my own jam for ages – we used to make tons of our own in Russia along with lots of pickled things which were so good, especially as an aside to a meal, but i’m digressing here… Anyway, in the US, at least in NY, I’ve yet to make the economics of it work. 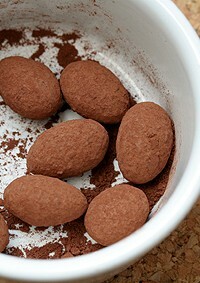 It seems WAY cheaper to get something like Bonne Maman (not amazing, but decent) than make my own. I might just say screw economics and do it anyway, I think it’s such a lovely process! Blame it on the “schwing” dentist (What’s his number, by the way? I’m in need of a good dentist.) and tell your pals that he requires you to limit your jam intake to save your precious chompers. That Sara is one smart cookie! Thanks for your feedback, folks. I’m thinking maybe I should start an Excel spreadsheet for her jams (Sara…help! ), gather your opinions on it and let you add to them when possible, then hand that sheet over to folks. I guess I’m smart to begin with a disclaimer that I haven’t tasted them. Sandra: Yes, there’s definitely pickles in France…les cornichons! Matilda: I love that. People are most comfortable with liars than honest folks. I guess it’s because if you’re honest and say, “I don’t know.”, they think you’re being evasive. I sure wish a few politicians would just admit that they “…just don’t know” as well. Melly: Those sour cherries from Picard are great…I think they’re one of the best bargains in Paris. Umami: It was Arpege. Some people do like it, but when the waiter brought me a mound of burnt eggplant puree which the waiter said it was burnt on purpose…yuck! The dining room is hideously ugly, and when a bowl of tomato soup costs 58€ you should get something pretty tasty. Laurie: Love the gift idea, although how much jam can a guy eat? Terrie: Since I don’t process my jams and use less-sugar than traditionally called for, I do refrigerate all my jams and jellies. I will be in Paris in early December. What Michelin 3 star are you speaking about? Large jars of jam are a form of slow torture: wonderful for the first 25 tastes and then I want to move on. I’m greedy, I want to try loads of flavours – sometimes during the same meal. My ideal jam world is one where I have several jars of about 100g apiece – not those nasty airplane or hotel ones, though, all different home-madey shapes too. Loved reading this–and the image of your fridge crammed with all that jam! I have to say something in defense of Arpege for those who don’t know it. Yes it’s exhorbitantly expensive and you should always send back bad food, even in a 3 star. Lucky for them you weren’t a Michelin man. I have to admit that I’ve eaten there a few times and I’ve even heard Passard critique his own work. While he may be in the overrated Michelin club, he has reenergized the French restaurant scene. Gone are the days of beef and more beef and more butter. He has his own vegetable farm, two now, for god sakes, the vegetables come by TGV! But the main dining room is bad, go downstairs. When we met Fran’s dad this past summer and he said that the Lemon was his favorite we pulled out our sample jar at home and were impressed again (very tart, but not bitter, and 1/4 the calories of lemon curd!). These are gourmet spreads at $6 per 8 oz jar (how big are the Ferber jams?) as they are sweetened with only high quality honey and agave nectar. The raspberry is great too and all the berry varieties are organic. My least favorite is strawberry just because I love the taste of fresh strawberries and have never liked the cooked taste of strawberry jams, but I’m not going to tell someone who happens to love strawberry jam not to try Fran’s Strawberry! How about writing a book full of jam recipes? C. Ferber’s orange with elderflower jam is sublime! 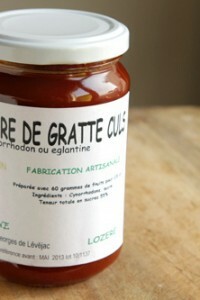 It has a texture entirely unlike traditional marmelade. I. too, make my own jam but hers is the best I have found in stores (along with an artisanal jam maker from Madagascar whose name escapes me — her jams are sold at Pralus in Paris and at the Galeries Lafayette Gourmet).